I wonder if I will get nervous in the group: should I still do the course? I think it is very common for people to feel nervous or uncomfortable when in they are in a group that is dealing with personal issues (as compared to, say, a more technical or practical group like a committee meeting). It’s to be expected and in a way is a good and normal thing, because it means that your emotions/feelings are becoming available to you and can be worked on by you during the course. One thing I want to stress is that whilst on the course you will never be pushed by me to do anything or work on anything you don’t want to do: one of the main principles of co-counselling is that the client is in charge of the content, pace and depth of their work. Is co-counselling just a version of “you tell me your problems and I’ll tell you mine”. It might look like that at first glance, because some of the same things happen in a co-counselling session as in an ordinary conversation, i.e. two people sit down and talk about themselves, and share the time. The difference is that both people are trained in a specific method of working on issues, a method that includes not only words but also voice, sound, body and action. One person will be listening in a way that is taught on the course: the listener is also trained in making responses might be helpful in order to invite the ‘talker’ to go further in his or her work. Is there only one type of co-counselling? I don’t think so. 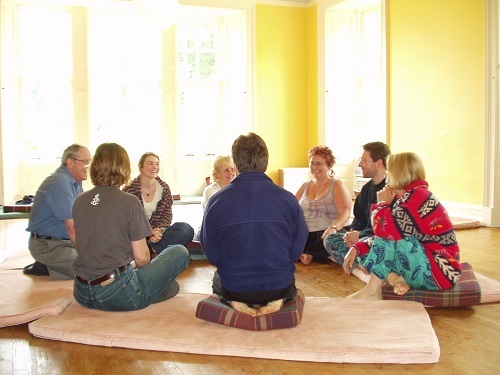 Co-counselling essentially uses techniques that come from from humanistic and psychodynamic therapies. Co-counselling is an explorative approach helping you to get to know yourself and link up your feelings, thoughts and actions in order to have more control over your life and live fully. In different parts of the world there may be slight differences, but the principles and approaches are pretty universal. What benefit would it be to my CV if I could put that I learned to do co-counselling? If asked about it, you would get some interesting conversation opportunities with your interviewer about your personal growth. What does co-counselling qualify me to do? If you engage with it, you will find yourself able to listen to yourself more. That may help you deal with others. Are there enhanced career opportunities that co-counselling might it lead to? Directly, none. Indirectly, it’s up to you, because co-counselling invites you to put yourself in the driving seat of your life. No guarantees with co-counselling: it’s about exploring yourself in a way that’s very much outside the usual ways. I had a ‘co-counselling session’ once with someone who said he was a co-counsellor and would show me how to do it. In my time, he kept jumping in and taking over. Will that happen on the course? I can see that it’s no good if the counsellor keeps jumping in and taking over. On my course I put a lot of emphasis on the fact that the client is in control of their session and their work. I teach that the interventions that come from the counsellor are simply prompts, delivered in a kind of shorthand that we all understand. These prompts may be ignored by the client if they don’t fit, and the counsellor must not persist with prompts that the client chooses to discard. The problem you described is not one I see on the courses I run. On the course, will I have to talk about stuff I am not yet ready to talk about with a group of strangers? This relates to the above, i.e. ‘client in charge’. At the start of each course I say that everything is optional (except for a few ground rules; confidentiality etc). It’s very, very important that no one on the course feels pushed into doing or saying anything (as in 1-2-1 therapy.) The course necessarily provides invitations to work on our challenging areas, our difficulties, pain and hurt, resentments etc. But this must be done at our own pace. There are suggested topics for the sessions during the course, but I emphasise from the start that the client responds to those invitations in their own way, at their own pace, and even totally ignoring them if they wish, and choosing a different topic. If I am in a co-counselling session working on some difficult feelings, will I get overwhelmed, especially as my co-counsellor will probably not be a professional therapist? This is addressed on the course. I have a 2 year counselling studies background: will I be going over work I am already familiar with? I have just got a place on a counselling course in a local college: will the co-counselling course just be going over the same stuff as there? I am seeing a (person-centred or psychodynamic) counsellor: should I just stick with that?